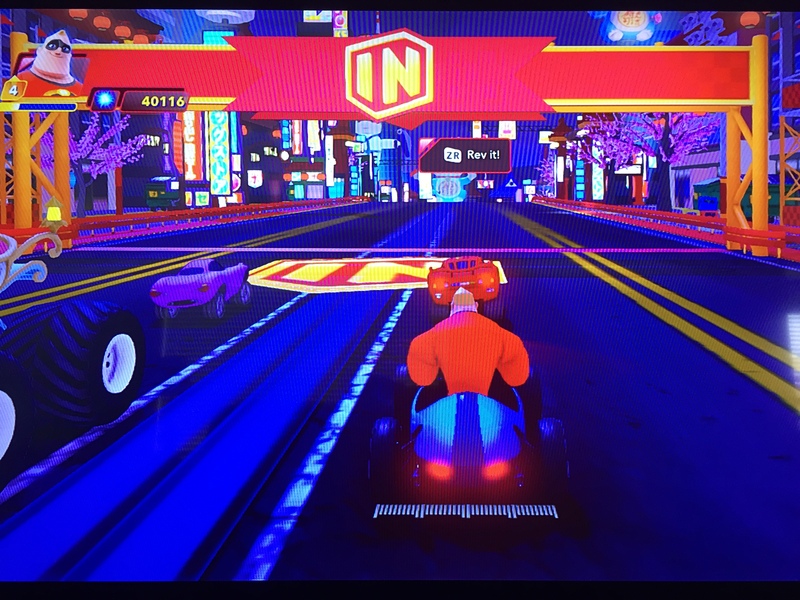 Thanks to the folks at Disney Interactive I had the chance to preview the new Toy Box Speedway and my daughter and I have been playing it ever since. There’s a lot of fun to be had in this newest expansion. Like the rest of the Toy Box, the speedway offers a lot of freedom. Every character can be used and any vehicle in your possession can be taken for a ride. Within the speedway, you can drive around the track, or test your skills doing different tricks with your vehicle. There are ramps, rails, jumps, and hills, making the center of the speedway more like a skate park than a race track. There are a couple of buildings also. Going to the tire shop, you can change the tires of your vehicle to create a monster car simply by driving over the wheel symbol on the ground and going to the garage and driving over the gas symbol fills up your turbo meter. Once you explore the raceway enough, there are three different race options to choose from – time trials, battle race, and race mode. Each one is pretty much what you’d expect. In time trials you compete against a computerized “ghost” car. If you beat the time of the computer, you win the time trial. In race mode you compete against three other opponents (either computerized or human) where largely its a matter of driving skill and tricks to create boost power. In battle race, you run into light shield which provide your car with a random weapon. You can store up to two weapons which can then be used against your opponents to create opportunities. Of course, they can you them against you, too. In each race you can choose from three different engine power options and nine different courses. For the race mode, you can also choose between a single race or Grand Prix (which is 3 races in a row in three different environments). As you earn a gold medal in each of the three types of races, a statue appears on the speedway. When you earn all three golds in each location, you receive a ticker tape celebration complete with fireworks – but that’s it. No prize, no extra car, no new features. At least as far as I know. I’ve only earned gold in all three types of races in one place so far! Handling at times can be tricky and takes time to master. The computer is a good opponent, but not unbeatable. Some racing games get so progressively difficult that it seems unbeatable, but the Toy Box isn’t like that. Instead, you will get hours and hours of game play with lots of fun exploring the different tracks and hidden little tricks on those tracks. 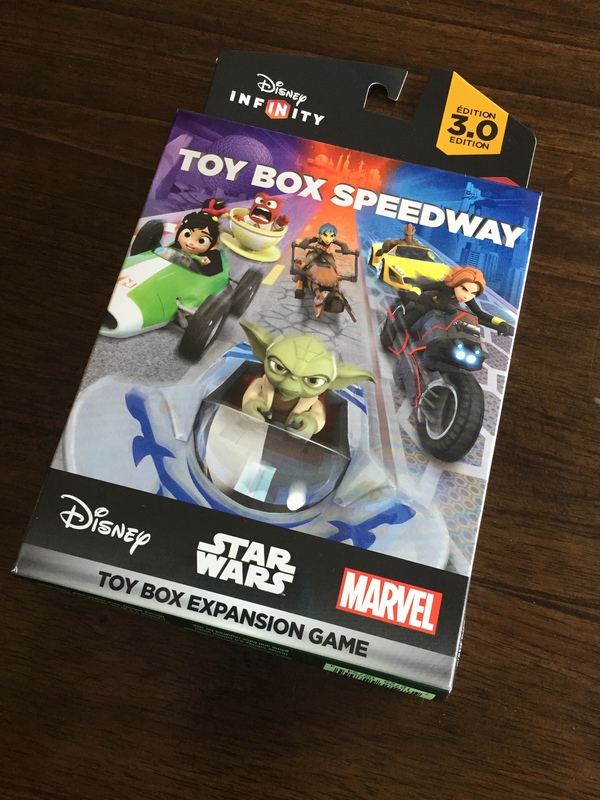 But unlike the Toy Box, there isn’t an opportunity to build or modify the speedway. There isn’t a place to purchase upgrades or add-ons or even new cars. And except for the guy who trains you how to operate your car, there isn’t anyone to talk to. It can be lonely on the speedway, but maybe you’ll have too much fun to notice. Despite the lack of these features, this newest addition to the Infinity 3.0 system is wonderfully fun. You’ll end up spending hours and hours in front of your television (or screen) playing and exploring all of these various worlds. And at only $19.99 – it is definitely worth the investment! 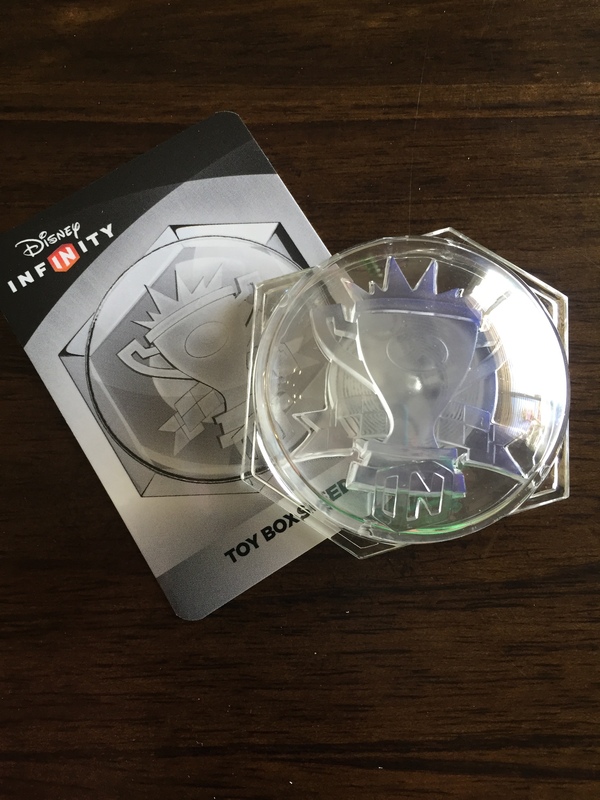 For anyone who likes the Toy Box, you’ll want to get this expansion.